New Harriet Carter Crap, Yay! Holy sh!t there’s a bomb in my bed! Son-of-a-b!tch here come the Nazi’s! Mother F**ker there’s another bomb in my bed! Ouch, that $#%$# just shot me in the $%#$@ foot! I’ve been looking for weapons of mother f%#%$ mass destruction and all I got was this lousy t-shirt! Hey F**k face that’s MY camel that you just tossed a grenade at! Hey President Bush, if you wanted this war so much why don’t you get your mother $#%$@ lazy stupid #$#*^ unintelligent f%#^$@ hillbilly @SS over here and $%$# fight this war yourself you son-of-a-b$#ching mother $#&* jackass! I would recommend reading this one to your kids at bedtime. Goodnight! Product # 2 – No joke, this might actually be “Failure Model Chicks” mother modeling this cat t-shirt. If so, this lady’s new nickname shall be “Madre de Failure Model Chica.” What a wonderful shirt and look how happy “Madre de Failure Model Chica” is to model it. It says, “Cats are Proof that God Loves Us and Wants Us to Be Happy!” Yeah, no it actually doesn’t. The t-shirt should say something catchy like this: “Cats are Proof that God Has Pitty For You Because You Are All Alone and Is Hoping That You Get So Desperate That You Actually Start Thinking The Cats Are Talking to You. 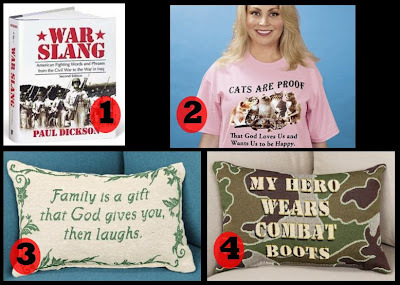 In Fact, God Thinks It’s Funny That You Have So Many Cats That He Has Instructed Harriet Carter to Create and Sell a T-Shirt That Will Force People To Make Fun of You on a Daily Basis.” That all rhymed, right? As a side note, cats are also proof that the hair that was in the brownies you made and brought to work from someones surprise baby shower actually was not your hair, but your cats filthy lice infested hair that accidentally got into the bowl when you allowed “Whiskers” to lick the egg beater. Product # 3 – Awesome! New pillows with confusing sayings! This prized pillow says, “Family is a Gift that God Gives You, Then Laughs.” Awwww that’s sweet. Wait, what? Hey Harriet why don’t bring those pillows to the childrens cancer unit at the local hospital and pass them out to their parents. I’m sure they’ll simply be laughing for hours! Ok was that crossing the line? I kinda thought it was, but it wasn’t like I was making fun of the kids, just the pillow. By the way, that last sentence appears on the back of the pillow. Product # 4 – This pillow is actually this weeks “bonus product.” It says, “My Hero Wears Combat Boots.” I chose this product because I know that without a shadow of a doubt as my sister reads this she is 100% absolutely thinking, “Your Mother Wears Combat Boots.” That’s right people I went with a personal product this time. It can’t all be about you. Sometimes I need a little Harriet for myself! Anyway, I’m going to start selling a pillow that says, “My Hero Sells Crap in a Catalog to White Trash Middle America.” I’ll sell tens of them!